"It was previously assumed this group slowly went extinct over a long time period, but that's probably not the case," said Russell Engelman, a biology MS student at Case Western Reserve and lead author of a new study on the group. "They were doing very well at the time they were supposedly on death's door." Engelman; along with Federico Anaya, professor of geological engineering at Universidad Autónoma Tomás Frías, in Potosí, Bolivia; and Darin Croft, anatomy professor at Case Western Reserve School of Medicine, describe the animals, where they fit in the family, and their paleoecology and paleobiology in the Journal of Systematic Palaeontology. "The only close relatives of palaeothentids alive today are shrew-opossums, small, poorly-known, ground-living marsupials that live in and near the Andes," Croft said. "Palaeothentid marsupials once included a diversity of species that filled a variety of roles in ancient ecosystems. During their heyday in the Miocene, they were abundant." These lower jaw fossils, combined with reexamination of other specimens, show that the skull of Acdestis was different from other palaeothentids. 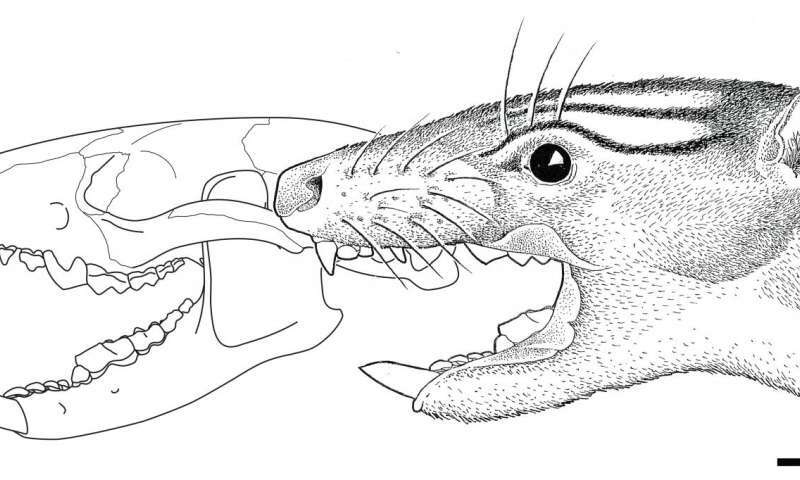 A. maddeni's snout is short and its canines are relatively large, followed by large, shearing middle teeth and molars well developed for grinding. "All this indicates it was a generalist," Engelman said. "Although it could eat fruits and insects like its relatives it could also catch small vertebrates and dismember them... It probably ate anything, like a hedgehog or Norway rat does." "Most species threatened with extinction are like giant pandas: highly specialized, live only in a certain area and eat only certain things," Engelman said. Due to their diversity and wide range, "the Palaeothentidae didn't fit the pattern of extinction." For example, fossils found at high latitudes in Argentina and Bolivia after the Middle Miocene Climatic Optimum indicate they withstood the dramatic cooling of the period. The family and opossums, which may have been competitors, appear to have overlapped for nearly 10 million years. Yet opossums didn't become abundant until 3 million to 4 million years after the family went extinct. "It's as if all the fossils in the U.S. came from Florida—you don't get the full picture," Engelman said. If new fossil sites are found in the northern two-thirds of the continent, "it will be interesting to see whether we find younger members of the group," Croft said. "That will help us understand their extinction."